(irritated) I'm sorry, I don't believe I heard you correctly. 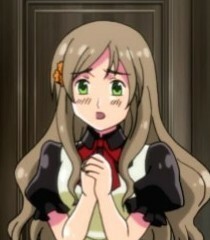 (confused/embarrassed) Austria?! W-what are you doing here? And so on that day of 1918 at 2 pm the contract to the countrys abolishment was signed and Prussia no longer exited Every year after that, Germany leaves a Blue Corn Flower on the steps of the Hohenzollern Castle where the first duke of Prussia ruled and lived. *Intense Crying* No! Its not true! Ah ha! There it is again! I've got you now, mysterious ghost voice! Hello everyone, this is Hungary. Er, well what are the questions, America?